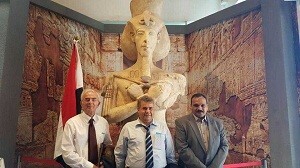 On Friday, Benha university's delegation presided by prof.Dr. EL-Sayed EL-kady returned back home after a business tour in Kazakhstan where he attended the Silk Road's universities meeting. This meeting is attended by the representatives of many universities in Russia, Hong Kong, England, China and Kazakhstan. This meeting ends up with many outstanding results that benefit both sides.